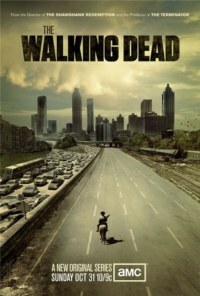 The Walking Dead Episode 1, I enter my viewing and reviewing of AMC’s newest series ‘The Walking Dead’ in an interesting predicament. I’ve been reading the series for a few years; not monthly, but I make sure to get the latest trade paperback collection the day it hits the shelves at my local comic book shop. Now, I face the challenge of reviewing episodes of a television series based on a comic that I’ve really grown to appreciate. To that end, I’m going to do my best to address ‘The Walking Dead’ in the context of the television series, with as little as possible reference to the comic book series. With all this in mind, I can safely say that ‘The Walking Dead’ is off to an excellent beginning. In the first episode (thankfully expanded to an hour and a half) we are introduced to Rick Grimes (strongly played by Andrew Lincoln), a world ravaged by an epidemic and haunted by the undead, and our hero’s mission to find his wife and son.